After Irma I was in desperate need of a little quick escape from my new post-apocalyptic reality. My sister, God bless her, booked me a ticket to fly home to Curaçao to see my frantic parents, who have not seen me since well before the hurricanes. Being so close to Bonaire it was impossible to ignore the offer of my new friend and fellow island writer, Liz from the hilarious blog The Adventures of Island Girl. I met Liz back in June at the Island Writers Retreat we both attended in San Juan, Puerto Rico. What a difference a few months make. Since then myself and several of these island writers hunkered down and survived two of the worst hurricanes in Caribbean history. Liz, along with the other women, was my rock in those dark days post-Irma. It has been a while since my last visit to Bonaire and a small reunion with my new island sister was to say the least, super appealing. So I decided on a whim to book a ticket on a tiny puddle jumper at the end of my Curaçao trip to see her. I am incredibly happy with that decision and thank heavens for friends like her. Divi Divi Air; always on time with very nice staff. My Bonaire adventure started the minute I walked out through the sliding doors at the end of the arrival hall and into the welcome of all welcomes. A welcome you can only really get away with on a small island where people tend to bend the rules a little or look the other way, especially on special occasions. I was surprised with my very own welcome committee curbside complete with cheers, shrieks, leis, Prosecco and “Despacito” (our theme song from the retreat) blasting from Liz’s car speakers. A handmade sign saying “Welcome Riselle” on it was the cherry on top. I teared up and was thankful at that moment for my mirrored sunglasses. Nobody likes a cry baby. Liz was really the only person I knew in this group. I quickly realized that the rest of the group came together to celebrate the arrival of a complete stranger. My heart burst into tiny little pieces of confetti at that thought. I am so grateful to each one of you. I really am. The rest of the trip was a whirlwind of fun girl chats and laughs, cocktails by the pool and sightseeing. Liz patiently took me to all of the places from my youth I so desperately wanted to see again and showed me her favorite hangouts. I was introduced to her friends, who were all very charming and welcoming. The thing about Bonaire that I love the most is how down to earth everyone is. Shorts, t-shirts over bikinis and swim trunks are the go-to outfit of the day for most, flip flops adorn everyone’s feet and beat up cars seems to be the preferred mode of transportation on the island. After driving around for 5 minutes I understood why. The island’s roads are riddled with potholes but for some reason this just adds to the allure. New friends on Bonaire. The kindest people I met in a while. Since it became a province of the Netherlands in 2010 along with Statia and Saba, Bonaire has been overrun with Dutch citizens. From Dutch chain supermarkets to Dutch brands and products, it can now all be found at every corner on the island. I was a bit taken aback by this. It was hard to see how the Dutch have completely taken over from the people of Bonaire. Regardless of this, I was happy to see that most of the island remained the same. It is still relatively quiet compared to most other islands. The people might have changed but the original charm of the island is still felt everywhere you go. For how long, I don’t know because it is vey apparent that “progress” is well underway, stomping its way through the tranquility of the island and destroying little landmarks to make way for condos, luxury apartments and lounge bars similar to those found in South Beach. Despite all of this, Bonaire offers the island life I was longing for when I decided to move back to the Caribbean 16 years ago. I was reminded that a simple life was why I moved to the islands in the first place. I wanted to drive around in a beat up jeep, live in a humble little island home, decorated with random objects found on the island, with a hammock on the balcony and a closet filled with flip flops, shorts and bikinis. In short, I wanted to live a life where material stuff and making money take a backseat for once. But as it happens to most, I too lost sight of those little dreams and fantasies and quickly immersed myself in work. A career seemed more important than the simple life I longed for and making money and becoming a respected name in society became my new goals. I found my soul sister in Liz. We often would just spent time at her beautiful island home, sipping on watermelon & rum cocktails and Prosecco, while talking about everything and anything from her friends and our island lives to Bonaire’s must sees or our common interest, island dogs. Looking back I think it was these days at Liz’s that I enjoyed the most. I found my writing mojo back there too. The tranquil setting at her home and her two charming mutts triggered the island writer in me to awake from her slumber. Fast forward to 5 days later and I find myself back at the tiny Flamingo airport feeling rather sorry for myself. No goodbye committee this time, only Liz, who by now has become a very close friend. My trip to her island paradise reminded me of what is truly important. Bonaire captivated me and enchanted me (again) with her beautiful clear waters, the friendliness of the people and the simplicity in the everyday life here. Needless to say I was sad to leave. For a moment I allowed myself to get lost in the fantasy of a simple life on Bonaire. But St. Maarten is where home is, at least it is for now. Bonaire has my heart in her grasp, firmly holding on to it until I return and reclaim it as my own again. 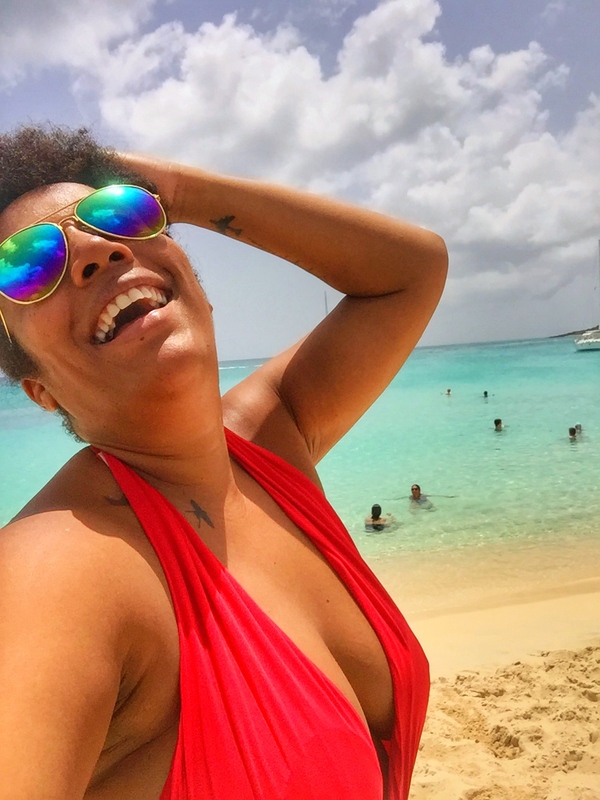 And so, bussed on Prosecco I boarded the tiny plane back to Curaçao, before my end destination of St. Maarten, filled with happy memories and my heart content with the new friends I’ve made. Bonaire may be known as the Diver’s Paradise but to me it will always be the island that stole my heart. *All opinion are my own. The above is based on my own personal experiences. I am heading to beautiful Bonaire in December. Can’t wait. Thanks for the great writing. I am now utterly obsessed with Bonaire. You and me both. It’s truly a nice place.